The Ten-Tec Model 1253 9 band regenerative shortwave receiver kit. A classic “first radio kit”. Ten-Tec has combined the very same audio output circuit of Ten-Tec transceivers with a modern FET design for classic regenerative SWL receiving plus one-button electronic band switching. Performance is exceptional for a radio in this price class. The listener should note, though, that any regenerative receiver takes time and patience to learn to use. 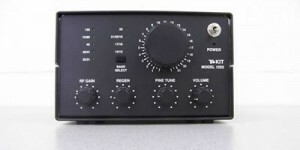 This entry was posted in Kits, Made in USA, Ten-Tec and tagged Made in USA, Model 1253, Radio Kits, Shortwave Radio Kits, Ten-Tec, Ten-Tec Model 1253. Bookmark the permalink.